Woodhall Spa is an inland Resort with a unique Edwardian character. 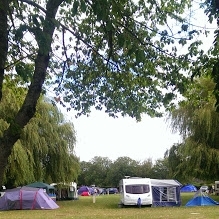 Jubilee Park is central to the life of the village. Now a registered charity, the pool and gardens provide a traditional environment in which to enjoy it’s delight. As a visitor to our Caravan Park, we hope you will enjoy all that this beautiful village provides. There is plenty here to keep all family members happy. The Park itself offers swimming, bowling, putting, croquet, table tennis and a children’s play area. The Kinema in the Woods is a unique opportunity to experience all the latest movies. The Petwood Hotel is a must for all Dambuster enthusiasts. A wealth of independent shops, cafes and restaurants are available within a 10 minute walk from the site. Steeped in aviation history, the local area has plenty to offer in terms of museums, in fact, Woodhall’s own Cottage Museum is well worth a visit.